Gustav Klimt had the gift of a painter from birth, however, he did not rely only on originality, but honed his art at the School of Decorative Arts, in Vienna. For a long time, his canvases were created in a familiar, academic manner, without betraying the artist’s true thrust for bright, fantastic images and colors. 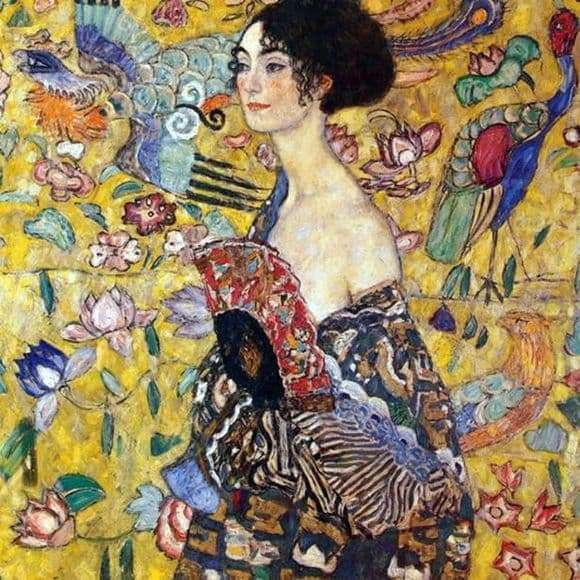 The meeting with Emilia Flage not only became a salvation for Klimt, but also turned all his work. Pictures appeared, glowing with love, female beauty and charm, sensuality and eroticism. This picture was the “Lady with a Fan”, written in 1917-1918. The lady is the ideal of a woman who could awaken in Klimte himself inspiration, attraction, reverent desires. The graceful noble bends of the body, subtle elegance, wisdom and detachment, showing only in a barely visible smile. The body, naked with slipped kimono, as if shows the liberated, half-naked soul of the earth goddess. And she does not notice this nakedness, she has nothing to fear, she doesn’t regret anything, she doesn’t want to hide anything. Fan, who covers the chest, holds a relaxed hand. The lady is beautiful… and she is not here. Maybe a woman in her memories, and maybe in her dreams and fantasies that are magical. Maybe it was these dreams that Klimt displayed with a whimsical background. Incredible flowers, unprecedented flowers – this is the world where there is a bewitching beauty now. Not a single frank touch, not a single bold moment, only a woman’s grace, dignity and beauty, but with what eroticism, desire, with what attraction the whole canvas breathes.